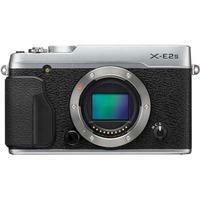 The Fujifilm X-E2S is a premium mirrorless camera that builds on the success of the original X-E2 to take its place in the prestigious X-series line-up. Chief among its new features is a Real Time Viewfinder with a display magnification of 0.62x and display time lag of just 0.005 seconds. The X-E2S has a lightweight body with a redesigned grip to replicate the rangefinder handling experience, while the X-Trans CMOS II Sensor and EXR Processor II ensure that it delivers high-quality images and superb overall performance. This edition is finished in silver.